SYNOPSIS: In the Buddhist kingdom of Bhutan, nestled deep in the Himalayas, two men seek to escape their mundane lives. Dondup, an educated university graduate decides that he will be better off picking grapes in the US than working as a government officer in a remote rural village. 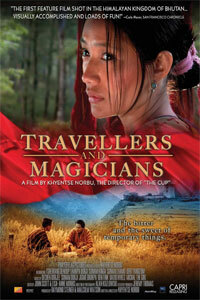 Tashi, a restless farm youth studying magic, cannot bear the thought of a life consigned to his village. Through a trick of his brother, he is delivered into a dream world of seduction and intrigue.